Anneli - A'la Foto (Homepage) wrote: So beautiful! Amazing that all those flowers can live there! Wolfgang (Homepage) wrote: Wonderful photo, I especially like the composition and this contrast of the colours of the flowers and the stones. Arnd (Homepage) wrote: Wow - a stunning photo of an equally stunning location! These blotches of color in the earth-colored environment are impressive eye-catchers! Calusarus (Homepage) wrote: This landscape is a marvel. buntagphoto (Homepage) wrote: Unusual color. Looks almost fluid and malleable. Arjan - PlasticDaisy (Homepage) wrote: I wouldn't mind such a view! 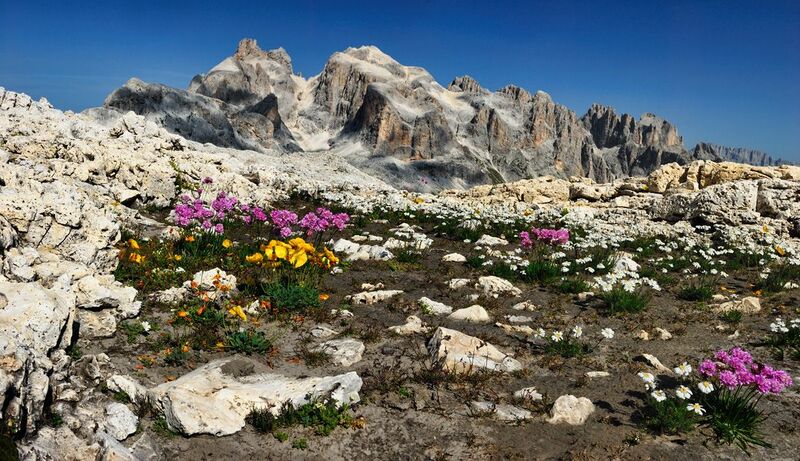 THe contrast between the sober rocks and the colorful flowers is very nice in this image. Andres (Homepage) wrote: Truly beautiful. Françoise (Homepage) wrote: Beautiful landscape. the colors are great and the shadows give a nice sensation on the pick of the mountains!